Thousands of cargo containers filled with much-needed supplies are sitting at the island's ports, but distributing those items has been difficult. A little more than a week after Hurricane Maria made landfall in Puerto Rico, ships continue to bring much-needed supplies to the island. But actually getting those items to the millions of people who need them is a whole new battle. Puerto Rican Gov. 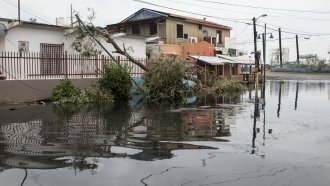 Ricardo Rosselló told CBS that food, water and medicine are all sitting at the island's main port, waiting to be delivered. Several reports estimate the number of cargo containers stranded on the docks is in the thousands. And finding truck drivers to distribute these supplies is hard. A spokesperson for Rosselló told CNN only 20 percent of drivers have gone back to work since the hurricane. Contacting the drivers also hasn't been easy. The Federal Communications Commission said Wednesday more than 91 percent of cellphone sites are down. And then there's the issue of getting the trucks on the road. The island has a severe gasoline shortage, and many roads are either blocked or damaged. More aid is is on the way. The Trump administration is sending more military personnel and ships to the island. And on Thursday, President Donald Trump agreed to loosen shipping restrictions for Puerto Rico after critics argued relief efforts were hindered.